I'll let you know as soon as soon as the first screencasts are published. But for now, can you help me but sharing this on social? If are looking into learning AngularJS with TDD, you've just found the right place. There are a lot of resources for AngularJS on the web, but not many of them will be showing you how to learn by testing. So many tools... what should I really use? The truth is, you don't need any complex tool to run tests. I'm not saying they aren't good; because they really are. But there ISN'T just one great way to set up a test environment. Once you learn how to write tests, you'll easily pick whatever tooling fits your projects better. In these screencasts, I'll be showing you the simplest possible setup. One that you can get started quickly and effortlessly port to a more complex setup later on. Along the way, you'll have access to a collection of test files you can use as a starting base for you own projects—knowing how each piece fits together. Give me your email below, and I'll let you know when the first FREE screencasts are published. for companies and startups around the world. confident to work in real-world front-end challenges in no time. Connect with @felippenardi at Twitter, Github and Medium. Need a 1:1 help on your current project? 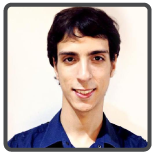 Book a session with Felippe at Codementor.io.